Background and objectives: Muscle relaxation therapy comprising general anesthesia and an intra-articular injection of betamethasone is commonly used to treat capulohumeral periarthritis. This treatment quickly improves the limited motion of the shoulder joint and restores the shoulder to its functional position, but cannot effectively inhibit the inflammatory response. Aseptic inflammatory pain can reportedly be relieved by silver needle acupuncture. However, there is insufficient high-quality evidence to validate the efficacy of silver needle acupuncture in the treatment of capulohumeral periarthritis. Therefore, the proposed study aims to evaluate the efficacy of silver needle acupuncture combined with muscle relaxation therapy in the treatment of capulohumeral periarthritis. Design: A prospective, single-center, open-label, randomized, parallel-controlled trial. Methods: Sixty patients with capulohumeral periarthritis will be assigned to receive either silver needle acupuncture plus muscle relaxation therapy (n = 30) or muscle relaxation therapy alone (n = 30). Patients will be followed up at 3 and 14 days, and 1, 3, 6, and 12 months post-treatment. Outcome measures: The primary outcome measure is a Visual Analog Scale score obtained at 3 days post-treatment. The secondary outcome measures are: the Visual Analog Scale scores before treatment and at 14 days, and 1, 3, 6, and 12 months post-treatment; the Shoulder Joint Activity Function Rating Scale (Melle scale) score, American Shoulder and Elbow Surgeons Standardized Shoulder score, McGill Pain Questionnaire score, University of California at Los Angeles shoulder score before treatment and at 3 and 14 days, and 1, 3, 6, and 12 months post-treatment; 12-item Short-Form Health Survey score at 1, 3, 6, and 12 months post-treatment; and the incidence of adverse events at 3 and 14 days, and 1, 3, 6, and 12 months post-treatment. Conclusion: The study results will provide evidence indicating whether silver needle acupuncture plus muscle relaxation is more effective than muscle relaxation alone in the treatment of capulohumeral periarthritis. We hypothesize that silver needle acupuncture plus muscle relaxation not only improves shoulder joint function, but also reduces inflammatory pain in the shoulder joint. Ethics and dissemination: This study was approved by the Medical Ethics Committee of the Affiliated Hospital of Qingdao University of China on June 25, 2018 (approval No. QDDXFSYY-LL-06-25). This study will be performed in strict accordance with the Declaration of Helsinki formulated by the World Medical Association. Written informed consent regarding the study protocol and surgery procedure will be obtained from each participant. This study was designed in June 2018. Patient recruitment and data collection began in September 2018 and patient recruitment will end in April 2019. Result analysis will be performed in May 2020. This study will be scheduled to end in June 2020. Results will be disseminated through presentations at scientific meetings and/or by publication in a peer-reviewed journal. Trial registration: This study was registered with the Chinese Clinical Trial Registry (registration number: ChiCTR1800016706). Study protocol version: 1.0. Capulohumeral periarthritis, also known as frozen shoulder, refers to chronic aseptic inflammation of the shoulder joint capsule and its surrounding ligaments and tendons.,,,, The extensive inflammation in the shoulder joint capsule and the surrounding tissues as well as the degenerative changes of these tissues cause pathological changes such as fibrous adhesion and thickening of the soft tissue; these changes limit the active and passive ranges of motion of the shoulder joint, particularly in performing external lifting, external rotation, and internal rotation. Capulohumeral periarthritis mainly manifests as gradually worsening shoulder pain and limited shoulder activity (particularly at night), which gradually improves until full recovery.,,,, Capulohumeral periarthritis has a large negative effect on the patient’s ability to work and quality of life, and can even lead to depression. At present, the most common treatment for capulohumeral periarthritis is shoulder manipulation under general anesthesia in combination with an intra-articular injection of a corticosteroid such as betamethasone., This treatment strategy can soften hyperplastic connective tissue, resolve muscle spasm, improve joint adhesion and contracture, and rapidly alleviate the symptoms of limited shoulder joint activity, but cannot relieve the inflammation. Silver needle therapy is a type of acupuncture that can gradually loosen adhesions, smooth joints, improve the local blood circulation and lymph circulation of the shoulder joint, and promote the metabolic absorption of inflammatory mediators and their metabolites. Silver needle therapy can also stimulate peripheral proprioceptors to activate the central analgesic system, promoting the secretion of endorphin or encephalin-like substances, and thereby exerting analgesic effects and reducing the pain response., Silver needle acupuncture is performed at the Affiliated Hospital of Qingdao University to eliminate aseptic inflammatory pain; the targeted sites are mainly the muscle, tendon, and fascia, rather than acupuncture points. 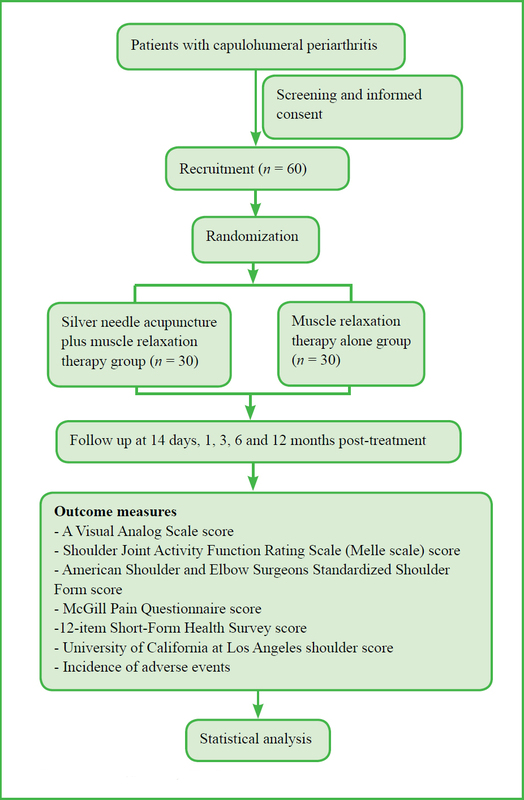 This randomized controlled trial will be performed to evaluate whether silver needle acupuncture in combination with muscle relaxation for capulohumeral periarthritis can improve shoulder joint function and reduce inflammatory pain in the shoulder joint. This prospective, single-center, open-label, randomized, parallel-controlled trial will include patients with capulohumeral periarthritis scheduled to receive treatment in The Affiliated Hospital of Qingdao University of China. Recruitment of patients will be done via advertising leaflets that will be distributed to patients in the hospital clinics and wards. Interested patients or their family members will contact the principal investigator via telephone. Patients will be included in accordance with the eligibility criteria. In accordance with the pre-designated sample size of 30 patients per group, 60 patients will be randomly assigned to two groups. Documents detailing the randomization files will be preserved. One of two types of cards (A or B) will be placed into each of 60 opaque envelopes numbered 1–60. The sealed envelopes will be distributed among the investigators. A random number table will be generated using SPSS 22.0 software (IBM, Armonk, NY, USA). Each eligible patient will be assigned a random number, and will then be given an envelope marked with that number. If the card inside the envelope has A on it, then the patient will be assigned to group A, which is the silver needle acupuncture plus muscle relaxation group. If the card has B on it, then the patient will be assigned to group B, which is the muscle relaxation group. Thus, the investigators will not know the whole grouping sequence in advance. Consecutive patients will be enrolled. Each eligible patient will immediately begin to undergo treatment in accordance with their assigned group. This study is an open trial, and blinded grouping will not be used. In the muscle relaxation group, non-steroidal anti-inflammatory drugs and traditional Chinese medicines responsible for activating blood circulation and removing stasis will be administered to promote blood circulation. After relevant laboratory tests and imaging examination, muscle relaxation treatment and intra-articular injection of sodium hyaluronate (Shandong Boshilun Furida Pharmaceutical Co., Ltd., Jinan, Shandong Province, China; National Medical License Number H10960136) and betamethasone (Shanghai Xianling Baoya Pharmaceutical Co., Ltd., Shanghai, China) will be performed under general anesthesia. Patients with substantially limited joint mobility (abduction < 120°, or flexion and extension < 120°) and those with abduction or flexion of 120–180° for more than 1 month will undergo muscle relaxation therapy. Muscle relaxation therapy comprises raising the arm to 180° and abducting the shoulder joint to 180° under general anesthesia. When shoulder joint adducts to 180°, the arm is close to the front chest, and when the elbow is extended, the tip pf thumb is able to reach the spinous processes of the 8th thoracic vertebra. After muscle relaxation therapy, 1% lidocaine will be administered to partially block the pain around the shoulder joint. In the silver needle acupuncture plus muscle relaxation group, patients will undergo silver needle acupuncture in addition to muscle relaxation therapy. Silver needle acupuncture (silver needles obtained from Shanxi Hangzhong Baxiang Medical Science and Technology Co., Ltd., China) is performed at the most tender position. The silver needle is inserted to a depth of 1.5 cm. The silver needle is then heated to 42°C and maintained at this temperature for 25 minutes. The patients will be instructed to keep the treated skin area away from water for at least 3 days. There are no reported contraindications for silver needle therapy. Study flow chart is shown in [Figure 1]. A Visual Analog Scale (VAS) score obtained at 3 days post-treatment: It is used to evaluate shoulder pain. The VAS score ranges from 0 to 10 points, with a higher score indicating more severe shoulder pain. American Shoulder and Elbow Surgeons Standardized Shoulder Form (ASES) score before treatment and at 3 and 14 days, and 1, 3, 6 and 12 months post-treatment: The current scoring method uses a patient-based subjective score, including pain and life functions, with a total score of 100. The higher the score, the better the shoulder joint function. McGill Pain Questionnaire (MPQ) score before treatment and at 3 and 14 days, and 1, 3, 6 and 12 months post-treatment: The scoring system is to evaluate the sensory (11 words) and affective (4 words) qualities of the patient’s pain. The patient ranks each of the words on a categoric scale of none, mild, moderate, and severe, which corresponds to a score of 0, 1, 2 and 3, respectively. A higher score indicates more severe pain in the shoulder joint. 12-item Short-Form Health Survey (SF-12) score at 1, 3, 6 and 12 months post-treatment: A higher score indicates better quality of life. University of California at Los Angeles (UCLA) shoulder pain score before treatment and at 3 and 14 days, and 1, 3, 6 and 12 months post-treatment: It rates pain in terms of pain (5 points), function (10 points), active forward flexion (5 points), strength of forward flexion (5 points), and satisfaction of patient (5 points). The evaluating outcomes can be rated as three levels: excellent (34–36 points), good (29–33 points), and poor (< 29 points). Pain, function, and satisfaction of patient are evaluated by patient themselves, and active forward flexion and strength of forward flexion are evaluated by physicians. The incidence of adverse events at 3 and 14 days, and 1, 3, 6, and 12 months post-treatment: The adverse events at each follow up time point are recorded, including headache, local swelling, local infection, and soft tissue adhesion. The incidence of adverse events is calculated according to the formula: Incidence of adverse events = number of patients having adverse reactions/total number of patients ×100%. Schedule for primary and secondary outcome measures is shown in [Table 2]. Investigators should make a record of adverse events (details shown in secondary outcome measures) during the trial. All adverse events-related details (first onset time, severity, and management method) will be recorded and reported to the project manager and the study’s ethics committee within 24 hours. According to our clinical experience, it was hypothesized that the VAS score at 3 days post-treatment was 4.60 ± 0.55 and 5.20 ± 0.84 in the silver needle acupuncture plus muscle relaxation therapy group and muscle relaxation therapy alone group, respectively. Assuming α = 0.05 (two-sided), β = 0.2, power = 80%, a final effective sample size of n = 22 per group (total 44) was calculated using the PASS 11.0 software (PASS, Kaysville, UT, USA). Assuming a patient loss rate of 35%, we would require 30 patients per group. All data will be statistically processed using the SPSS 22.0 software (IBM, Armonk, NY, USA) and follow the intention-to-treat principle. Normally distributed measurement will be expressed as means and standard deviation. Non-normally distributed measurement data will be expressed as lower quartile (q1), median, and upper quartile (q3). Count data will be expressed as percentages. Repeated measures analysis of variance will be used for comparisons of VAS score, Melle scale score, ASES score, MPQ score, SF-12 score, and UCLA score in the same group between different time points. The least significant difference test will be used for pairwise comparisons. Two-sample t test (normally distributed data) or Mann-Whitney U test (non-normally distributed data) will be used for comparisons of abovementioned indices between two groups. Pearson chi-square test will be used for comparing the incision of adverse events between two groups. An inspection level of α = 0.05 (bilateral) will be considered. Included patients will consist of populations assigned to per-protocol set. The populations refer to those who complete the trial, meet the inclusion and exclusion criteria, provide effective baseline value, have good compliance, do not violate the study, and complete case report form. All data will be collected in the case report forms. After accuracy and completeness confirmation, written records will be transferred to an electronic format using a double data entry strategy. All collected data will be statistically analyzed by a professional statistician. The statistician will make a statistical analysis report, and the principle investigator will give a final report. The confirmed data documents will not be altered, and preserved for later use. Any unauthorized investigator will not have the right to review or use the data. All data dedicated to this study will be preserved by The Affiliated Hospital of Qingdao University of China. The role and responsibilities of the Independent Data Monitoring Committee will be relative to the project steering committee, including doctors with related professional backgrounds, clinical pharmacologist and/or toxicologists, epidemiologists, radiologists, statisticians, clinical trial managers, and ethics experts. Physicians responsible for silver needle acupuncture and muscle relaxation therapy should have undergone professional training, and be skillful in silver needle manipulation, surgical instrument and equipment use. They should acquired a professional title of attending physician or higher. Patients included in the clinical trial will be monitored and followed up, and may undergo close examinations in our hospital without charge. This study was approved by the Medical Ethics Committee of the Affiliated Hospital of Qingdao University of China (approval No. QDDXFSYY-LL-06-25) on June 25, 2018. This manuscript was prepared according to the Standard Protocol Items: Recommendations for Interventional Trials (SPIRIT) guidance (Additional file 1 [Additional file 1]) and will be performed in accordance with the Declaration of Helsinki. Patients will volunteer to participate in this study (Additional file 2 [Additional file 2]). If there is a risk other than expected in the trial, the investigators should modify the relevant content of the informed consent together with the sponsor. After agreement by ethics committee, the participants who will be affected or their guardians will re-sign the modified informed consents. Results will be disseminated through presentations at scientific meetings and/or by publication in a peer-reviewed journal. Trial data will be published with Chinese Clinical Trial Registry. Muscle relaxation therapy under general anesthesia to restore the shoulder to its functional position is currently the main treatment of capulohumeral periarthritis. Shoulder manipulation under general anesthesia combined with muscle relaxation through an intra-articular injection of betamethasone is the most common treatment of capulohumeral periarthritis. This treatment quickly improves the limited motion of the shoulder joint and restores the shoulder to its functional position, but cannot effectively inhibit the inflammatory response. A silver acupuncture needle is made of silver and a little copper-nickel alloy. It is slightly larger in diameter than the ordinary acupuncture needle. Patients feel more sensitive to silver acupuncture needle stimulation., When the silver acupuncture needle pricks the tender point through the skin, it creates an inflammatory reaction of the local tissue and promotes the repair of local tissue. In addition, silver needle acupuncture can promote the release of the spastic and stiff muscle. When the needle tail is heated, heat can be transferred to the inner of the tissue through the needle bod. This can improve surrounding microcirculation, promote the discharge of metabolic wastes and nutrient intake, and contribute to the recovery of damaged tissue. Clinical studies have demonstrated that silver needle acupuncture therapy can effectively reduce inflammation, increase local blood supply, release muscle spasm, and alleviate pain induced by various causes., There is insufficient evidence from randomized controlled trials to confirm the efficacy of silver needle acupuncture in the treatment of capulohumeral periarthritis. Silver needle therapy has been used in clinical practice for more than 20 years. The Affiliated Hospital of Qingdao University has implemented silver needle therapy for more than 10 years. More than 10,000 patients have benefited from silver needle therapy in our hospital. Silver needle therapy can well improve local blood circulation and loose spastic muscle through heat transfer. It can reduce muscle aseptic inflammation and relieve pain from a variety of diseases such as tension headache, joint pain, and non-specific low back pain. Therefore, silver needle therapy combined with muscle relaxation therapy is an effective treatment method of capulohumeral periarthritis and can greatly shorten rehabilitation time. This is the first randomized controlled study protocol to investigate the efficacy of silver needle therapy combined with muscle relaxation therapy in the treatment of capulohumeral periarthritis reported in China. This study will not use blind evaluation. Results are relatively simple, and follow up bias easily occurs. These likely influence the accuracy of results. The study results should be further validated by multi-center, large-size randomized controlled trials. This study investigates the efficacy of silver needle heat transfer-assisted muscle relaxation therapy through assessing functional recovery to evaluate the effects of silver needle therapy in the treatment of capulohumeral periarthritis. Date of registration: June 19, 2018. Study execution time: October 2018–June 2019. Trial status: Recruitment is ongoing. Additional file 2: Informed consent documentation (Chinese). Study design and authorization: JMY and CM; patient recruitment: JMY, JJY, CSL, YWY, FHX, and YSY; data collection and analysis: HHC and CM. All authors approved the final version of this manuscript. The study was approved by the Medical Ethics Committee, Affiliated Hospital of Qingdao University of China (approval No. QDDXFSYY-LL-06-25) on June 25, 2018 and will be performed in accordance with the Declaration of Helsinki. The authors certify that they will obtain all appropriate patient consent forms. In the form, the patients will give their consent for their images and other clinical information to be reported in the journal. The patients understand that their names and initials will not be published and due efforts will be made to conceal their identity. This manuscript is prepared according to the Standard Protocol Items: Recommendations for Interventional Trials (SPIRIT) guidance. The statistical methods of this study were reviewed by the biostatistician of Affiliated Hospital of Qingdao University of China. Individual participant data that underlie the results reported in this article, after deidentification (text, tables, figures, and appendices). Data will be available immediately following publication, with no end date. Results will be disseminated through presentations at scientific meetings and/or by publication in a peer-reviewed journal. Anonymized trial data will be available indefinitely at with the Chinese Clinical Trial Registry. Zhou YZ, Hu B, Yuan ZQ, et al. Percutaneous dynamic release in stress position by acupotomy in treating severe scapulohumeral periarthritis. Zhongguo Gu Shang. 2018;31:452-457. Wang N, Wu XP, Sheng PJ. Clinical research on double-needle winding and pulling combined with electroacupuncture therapy in treating scapulohumeral periarthritis. Zhen Ci Yan Jiu. 2017;42:267-270. Sun H, Wan H, Zhang L, He X. Clinical observation of blood-letting to reduce pressure plus electroacupuncture for acute scapulohumeral periarthritis. Zhongguo Zhen Jiu. 2016;36:933-937. Yuan T, Wang F. Clinical trial of treatment of cervicogenic scapulohumeral periarthritis by red-hot needle therapy combined with cupping. Zhen Ci Yan Jiu. 2015;40:415-418. You Z, Yu BX, Deng TT, Dong BQ. Analysis on clinical palpation laws of muscle meridian focus in scapulohumeral periarthritis. Zhongguo Zhen Jiu. 2014;34:565-568. Chen Y, Yang J, Wang L, Wu Y, Qu J. 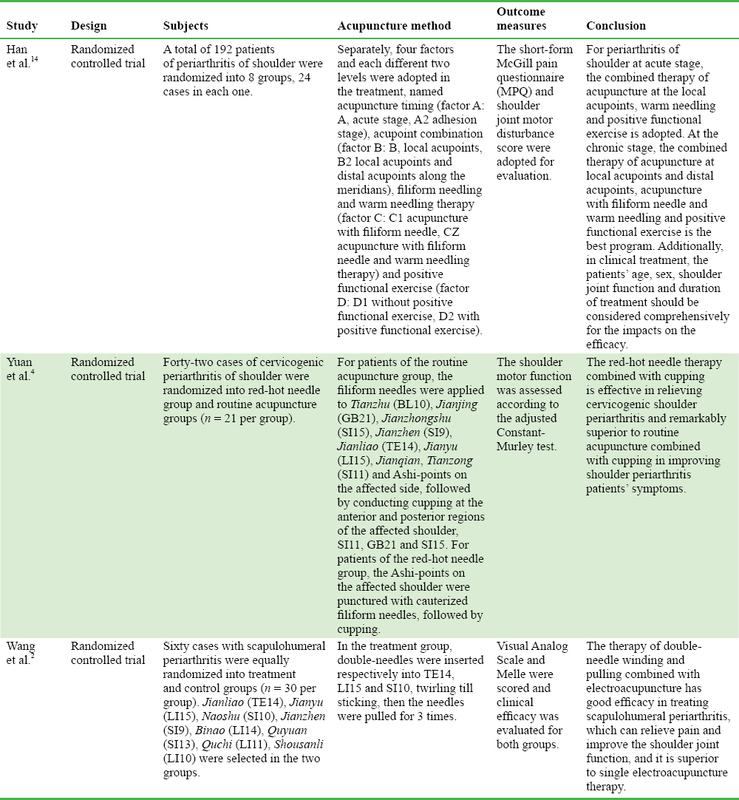 Explanation on evidence-based guidelines of clinical practice with acupuncture and moxibustion: periarthritis of shoulder. Zhongguo Zhen Jiu. 2017;37:991-994. Jin P, Jiang Y, Fang X. “Chuan Jia Re” combined with abdominal needle for 23 cases of periarthritis of shoulder with wind cold dampness type. Zhongguo Zhen Jiu. 2016;36:527-528. Liu C, Zhang N, Guo X. Discussion on point shuzhe for treatment of periarthritis of shoulder. Zhongguo Zhen Jiu. 2015;35:1214. Hu Z, Chen L. Floating needling reperfusion for 32 cases of periarthritis of shoulder. Zhongguo Zhen Jiu. 2015;35:1103-1104. Ji L, Wang H, Cao Y, et al. Sharp-hook acupuncture (Feng Gou Zhen) for patients with periarthritis of shoulder: a randomized controlled trial. Evid Based Complement Alternat Med. 2015;2015:312309. Ma S, Zong L. Clinical observations on mind-tranquilizing acupuncture for the treatment of scapulohumeral periarthritis at the early stage of adhesion. Shanghai Zhenjiu Zazhi. 2017;36:986-990. Wang QH, Du PB, Gong HT. Effects of adhesion releasing under nerve block and arthrolysis on adhesive scapulohumeral periarthritis: a comparative study. Zhonghua Yi Xue Za Zhi. 2008;88:177-178. Qiu QZ. Treatment of severe scapulohumeral periarthritis with combined use of suprascapular nerve blockade and manipulation therapy: a report of 49 cases. Zhong Xi Yi Jie He Xue Bao. 2006;4:82-83. Han ZX, Qi LL, Chu LX, et al. Program optimization in the stage treatment of periarthritis of shoulder with acupuncture, moxibustion and positive functional exercise. Zhongguo Zhen Jiu. 2014;34:1067-1072. Zhao Y, Qin Y, Zheng JJ, et al. Discussion on the temperature characteristic of silver needle in the human body during the warm needling. Zhongguo Zhen Jiu. 2012;32:803. Yi-Kai L, Xueyan A, Fu-Gen W. Silver needle therapy for intractable low-back pain at tender point after removal of nucleus pulposus. J Manipulative Physiol Ther. 2000;23:320-323. Ning H, Wang Y, Yuan Y, Ning H. Nursing and safety of silver needle diathermy treating ankylosing spondylitis. Pak J Pharm Sci. 2015;28:725-729. Knop C, Oeser M, Bastian L, et al. Development and validation of the Visual Analogue Scale (VAS) Spine Score. Unfallchirurg. 2011;104:488-497. Jia CS, Li XF, Ma XS, Shi J, Liu EJ. Comparison of analgesic effects between subcutaneous penetration needling and straight needling of otopoints in the treatment of scapulohumeral periarthritis. Zhen Ci Yan Jiu. 2008;33:339-42. Wong SE, Colley AK, Pitcher AA, Zhang AL, Ma CB, Feeley BT. Mental health, preoperative disability, and postoperative outcomes in patients undergoing shoulder arthroplasty. J Shoulder Elbow Surg. 2018;27:1580-1587. Senna LF, Ramos MRF, Bergamaschi RF. Arthroscopic rotator cuff repair: single-row vs. double-row clinical results after one to four years. Rev Bras Ortop. 2018;53:448-453. Liu CS, Zhang W, Xu FH, Yi YS, Yu JM. The effect of silver-needle diathermy on patients with pain of extra-spinal soft tissue. Qingdao Daxue Yixueyuan Xuebao. 2009;45:527-528.